Item1 - Faith Avis and H. M. Tory greeting people as they enter the building for a social gathering [1945-1946]. 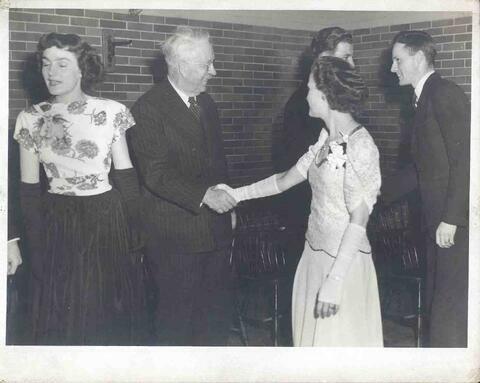 Item2 - Faith Avis and H. M. Tory greeting people as they enter the building for a social gathering [1945-1946]. Item3 - Faith Avis, Wally Avis and H. M. Tory greeting people as they enter the building for a social gathering [1945-1946]. Item4 - Faith Avis's degree certificate with signatures of all Journalism Faculty in 1946. Item5 - Portrait picture of "Harold (Abe) Morrison, Carleton 1946". Item6 - Group picture of "Faith (Hutchison) Avis, Harold (Abe) Morrison, Berry Cameron [and] Irwin Fricke, Carleton 1946 Journalism". Item 2 - Faith Avis and H. M. Tory greeting people as they enter the building for a social gathering [1945-1946]. Faith Avis and H. M. Tory greeting people as they enter the building for a social gathering [1945-1946].